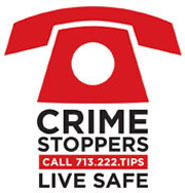 Crime Stoppers and the Houston Police Department’s Robbery Division need the public's assistance identifying the suspect(s) responsible for several aggravated robberies with a deadly weapon at Home Depot’s and Lowe’s stores. The same male robbed the Summerwood Home Depot on July 16, 2018 and then the Lowes store in Atascocita an hour later. The suspect then hit the Copperfield store located at 6800 Highway 6 North on July 18, where he threatened the cashier with a weapon and then robbed a Lowes in Sugarland July 26. In one of the robberies, the Hispanic male had an unknown black male with him. Suspect #1: Hispanic male, 25 to 35 years old, 5’06, 200 pounds, black hair, thin beard, tattoos on arms. Suspect #2: Black male, 25 to 35 years old.